Featured image: #WeRiseForClimate protest in San Francisco, September 8, 2018 from 350.org flickr. 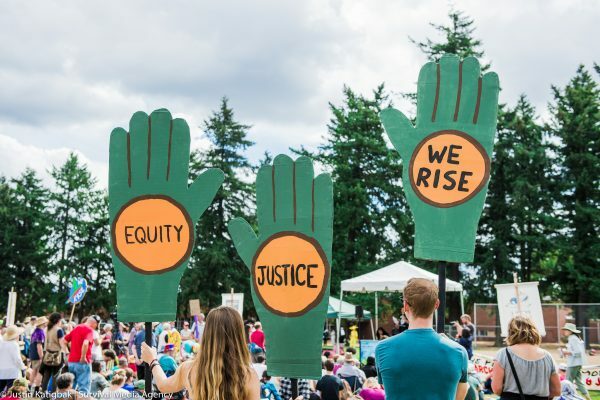 The Global #RiseForClimate actions are just one example of many that the climate justice movement is building the power needed to transform the economy and put in place policies to confront climate change. The ingredients exist for the climate justice movement to rapidly succeed. A challenge is not knowing how much time we have. Scientists have been conservative in their estimates, and feedback loops could rapidly increase the impacts of climate change. This year’s fires broke records set by last year’s fires, leading Governor Jerry Brown to describe them as the “new normal” caused by years of drought and rising temperatures. Researchers at Columbia University and the University of Idaho reported in 2017 that human-caused warming was drying out forests, causing peak fire seasons across the West to expand every year by an average of nine days since 2000. The U.S. Department of Agriculture said the 2017 fire season cost more than $2 billion, making it the most expensive fire season on record. Extreme heat is becoming more common because of climate change. Since 2001, 17 of the 18 warmest years on record have occurred. Records were broken all over the world this year. Record heat is also contributing to more ferocious storms. Storms with heavy rain and high winds are increasing, as the Union of Concerned Scientists warns. 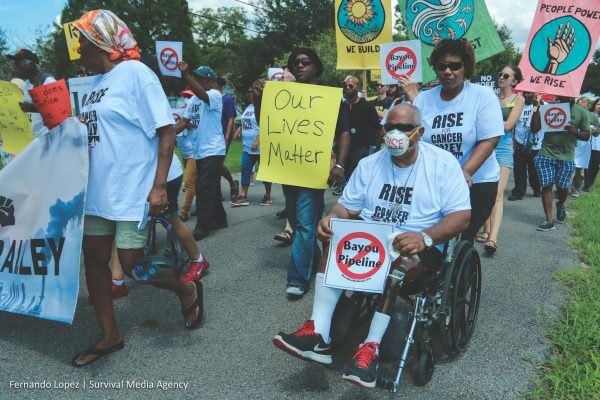 Our Lives Matter from #RiseOnClimate Flickr. Ironically, the oil and gas industry, which is accused of undermining climate science, is now asking government to protect it from the impacts of climate change. When Hurricane Harvey hit Texas, swamping Houston, it caused an immediate 28 cents per gallon increase in the price of oil. After Harvey a Texas commission report sought $61 billion from Congress to protect Texas from future storms. Joel N. Myers, of AccuWeather, predicted in 2017 that the total losses from Harvey “would reach $190 billion or one percent of the nation’s gross domestic product.” The cost of a 60 mile seawall along the Texas coast is initially projected to be $12 billion. Harvey broke the record set by Hurricane Katrina, which cost $160 billion. The 10 most destructive hurricanes caused an estimated $442 billion in losses. 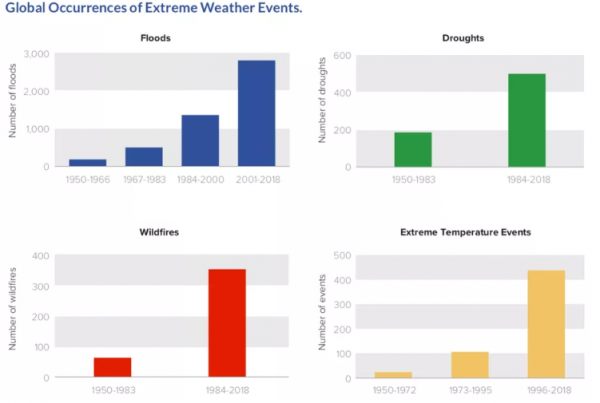 Out of 27 extreme weather events in 2016, researchers for the American Meteorological Society have correlated 21 of them to human-caused climate change. Impacts are seen throughout the United States. A report found that “since 2005, Virginia has lost $280 million in home values because of sea-level rise.” A 2018 study found coastal properties in five Southeastern states have lost $7.4 billion in potential value since 2005. The 2017 Hawaii Sea Level Rise Vulnerability and Adaptation Report estimates the lost value of flooded structures and land at over $19 billion. Additionally, Hawaii’s roadways, bridges and infrastructure will cost $15 billion to repair and replace. The National Flood Insurance Program is losing $1.4 billion annually largely due to claims in 284 coastal counties. The Congressional Budget Office finds the program is already $20.5 billion in the red even after the government forgave $16 billion in debt last fall. These are just some of the many costs — food, agriculture, fishing, oceans, storms, fires, droughts, heat, flooding and more are going to worsen significantly. Climate change could be the cause of the next economic collapse due to the cost of climate damage, an insurance industry crisis, or stranded assets, as over-investing in carbon energy has caused a fragile carbon bubble. While there has been progress on clean energy, it is inadequate and sporadic compared to the urgent needs. We need dramatic escalation with clear goals — keep fossil fuels in the ground, use agriculture and wetlands to sequester carbon, deploy renewable energy, build climate justice infrastructure and transition to a new economy based on sustainability, democracy and equity. This week, the world’s largest wind farm opened. It can power 590,000 homes in the UK. Another planned wind farm could provide the power for 2 million homes. The world is only scratching the surface of the potential of wind and solar. We can no longer afford the old carbon energy economy. A new climate economy would add $26 trillion to the global economy by 2030, a conservative estimate. It will create 65 million new jobs and prevent 700,000 premature deaths. This transformation provides an opportunity to create the future we want based on economic, racial and environmental justice. Just as we are underestimating the high costs of climate change, we have also “grossly underestimated the benefits and opportunities unlocked by smart, connected, distributed energy technologies,” David Roberts writes in Vox. We will look back after the transition and wonder why we waited as we will see “the benefit of quieter, safer, more livable cities and better respiratory health, we’ll wonder why we ever put up with anything else — why we nickel-and-dimed the transition to electric buses, long-haul trucks, and passenger vehicles; why we fought over every bike lane and rail line.” We can also implement Solutionary Rail – a network of electrified railroads that also serves as an energy grid serving rural areas and relieving roads of trucks. The 2018 New Climate Economy Report reports time is running out; extreme damage from climate change is being locked in. We need a sustainable trajectory by 2030. The developing world needs infrastructure and much of the developed world’s infrastructure is failing. The report finds, “The world is expected to spend about US$90 trillion on infrastructure in the period up to 2030, more than the entire current stock today. Much of this investment will be programmed in the next few years.” We need to spend this on creating a new sustainable economy. The report examined five areas: cities, energy, food and land use, water, and industry. Building sustainable, efficient, clean energy infrastructure will reduce health costs, and increase productivity and innovation. This requires policy based on equity, cutting fossil fuel subsidies while increasing the price of carbon, and investing in sustainable infrastructure. The good news is we have the ability and technology to make the transition. We know what works. We lack the leadership, but this leadership void can be filled by the people. When we lead, the leaders will follow. As the crisis hits and national consensus solidifies, people will need to demand a new economy based on equity, fairness, democratized energy and serving the necessities of the people and planet. This new democratized economy could include a federal buyout of the top US-based, publicly-traded fossil fuel companies. It could include the reversal of disastrous privatization with nationalization of key industries and public ownership of energy utilities to serve the public interest, rather than private interests. Polling on risks of climate change. Yale Program on Climate Communication, 2018. Despite mis-leadership by power holders and lack of commercial media coverage, people know climate change is having major negative impacts and want to action taken to confront it. Yale reports that polls show 83% want research funded on alternative energy, 77% want CO2 regulated as a pollutant, 70% want strict limits on CO2 from coal-fired power plants, and 68% even favor a carbon tax on polluters. Obama’s policies on climate were inadequate, and he led massive building of oil and gas infrastructure. The current administration denies climate change exists, hides research on climate, is reversing Obama’s positive steps and opposes the national consensus. This is going to lead to a climate justice boomerang. More storms and the cost of climate change will cause people to rebel and demand the transformation political elites have refused. There is an impressive mobilized movement; not just the Global #RiseForClimate, but people putting their bodies on the line and risking arrestto stop carbon infrastructure. Activists are successfully delaying the approval of pipelines, often with Indigenous leadership as their rights are crucial for climate justice. Activists are arguing their resistance against polluters is being done out of climate necessity and are sometimes succeeding. Oil companies are being sued for hiding the truth about climate change – former scientists are exposing them – and are now being forced to disclose climate change risks to shareholders. Activists are confronting investors of carbon infrastructure and insurance companies on coal. Workers are confronting unions on the issue. Youth are suing for a livable climate future. The movement is building power. The path needed is clear, but escalation is urgent.